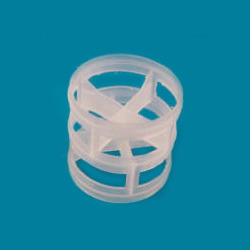 We bring forth for our patrons a range of Polypropylene Tower Packing Pall Rings. These products are highly apt for low pressure drop as well as high capacity applications. Our products make easy high degree of randomness and consists ratio of blocked as well as free passages which are autonomous of orientation. The huge surface area to volume ratio improves the rate of liquid film surface in order improve mass transfer.